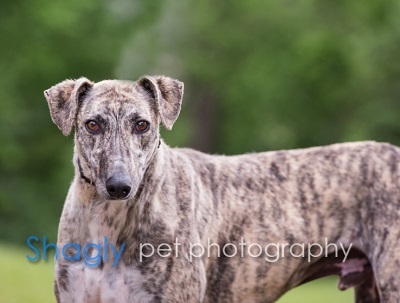 Bo is an approximately 3 year old lemon brindle male. GALT was contacted by a rescue group in New Mexico to take Bo and Uno into our program. The New Mexico rescue group obtained both boys from the SPCA in Abilene, TX earlier last year. 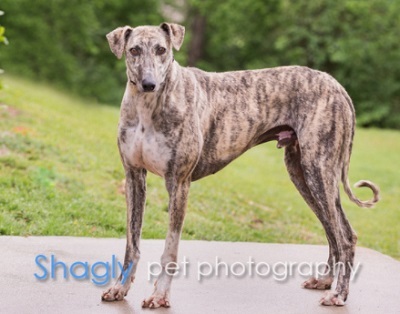 Bo's DNA panel shows that he is a Greyhound, Whippet, Borzoi mix. Bo is small dog tolerant but has not yet been tested with cats or other small animals. If Life Throws You A Lemon Brindle... Adopt It! Bo is a great big, handsome, loveable teddy bear with beautiful lemon brindle markings and the most adorable curl at the tip of his tail. Your heart will melt once you see his floppy ears and perfect "sit" and he will put you in a trance as he seems to stare all the way into your soul. Bo is a southern gentleman. He is quiet, sweet and submissive and he might just have the best manners of anyone in your home. Bo is a lover not a barker -- he is laid back and can go with the flow. He works hard to be gentle with people and gets along well with other dogs - even small ones. Bo is just the right amount of velcro - he likes to know where his people are, but does not need to be constantly in the way. He just likes for you to say his name and give him a good petting so he knows you love him. Bo is a fairly big boy and he is a good eater. No need to worry about what to feed him because he isn't fussy! Bo loves a good walk and does great on a leash. People really notice him when he is out because he is so striking. If you are looking for a sweet, friendly, lovable addition to your family, you must consider Bo!